She only wanted one thing...Doritos. 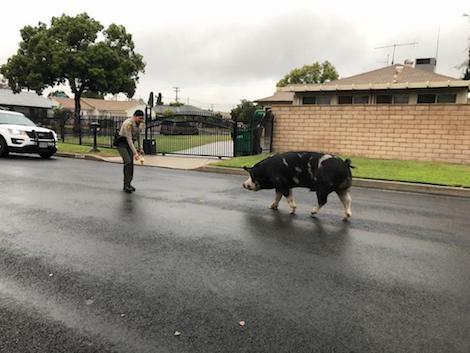 A giant pig, which has been described as the same size of a small horse, went on the loose in San Bernardino County, California, on Saturday. She apparently went missing because she had a case of the munchies and was on the hunt for some food. Although the LAPD were called to deal with the pig, she was completely innocent. As she walked ever so casually through the streets, she only had one thing on her mind – Doritos. It seems like the police officers, Ponce and Berg were able to read minds, as they pulled out a bag of the crunchy chip and began to lure the pig back home. Well if this doesn’t go on the list of unusual calls. You have to give credit to the pig, though. She knew what she wanted, and she knew how to get it. It’s not often that people would go to such lengths for a packet of Doritos, but determination is a crazy thing and she sure had a lot of it. Do you think the pig got what she wanted? Do you reckon her plan was clever? Let us know in the comments, or on Twitter at @WhatsTrending.